BUT WHERE IS THE RIVER TODAY? 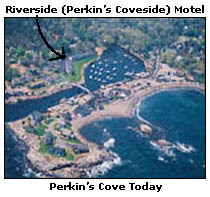 Perkins Cove did not take its present form (below) until its dredging in 1940. 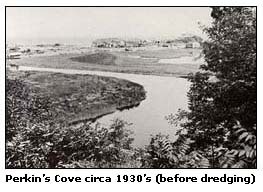 Prior to that time a tidal river (right) ran through what is today the Cove. Along the banks of this river Moses Staples built a salt water farm. Over time he began taking in the odd traveler and artist who were drawn to this area. As business improved he enlarged his summer boarding by remodeling his farmhouse into a summer hotel. He named this hotel the Riverside. Although the river is gone the name still remains.